I have been fascinated with fish ever since I was a boy, fishing off the rocks at Apollo Bay with Dad. My passion only grew with age and I was lucky enough to study marine and freshwater biology at university, and then go on to work as a government scientist, for CSIRO, and now the University of Melbourne. I am particularly interested in understanding how fish respond to environmental changes such as river regulation, drought and climate warming, and how we can use this knowledge to better manage our fisheries and conserve our marine and freshwater biodiversity. Through my fly fishing and research, I have realised just how remarkably hardy trout can be and the unexpected places they can turn up. Surprisingly, in Victoria, I’ve caught trout in the upper Rose River and in a little creek near Ararat when flow was reduced to a trickle. I’ve caught an amazing 3-pound brown in the Sevens Creek whilst surveying native fish and a rainbow in the heavily modified lower reaches of Cardinia Creek. I surveyed good numbers of browns in the remnant pools of the Lerderderg River at the height of the recent drought. That said, trout really like cold (preferably 10–14°C), well-oxygenated and flowing water for optimal growth. 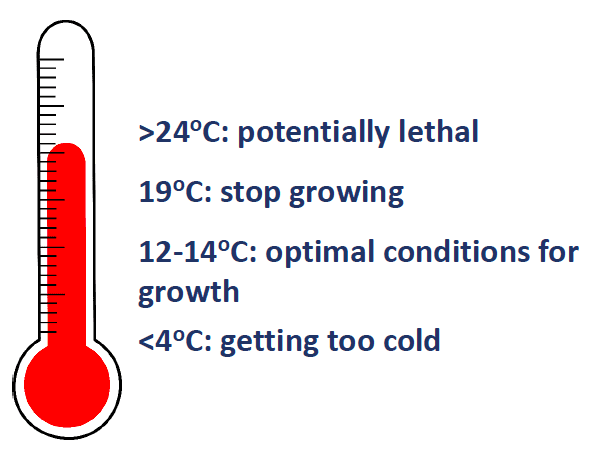 Trout generally stop growing when waters get warmer than 19°C, and prolonged time above 24°C can be lethal. Cool flowing water is becoming increasingly scarce in Australia, and this trend will continue for the foreseeable future, posing a real challenge to trout. Some of the facts around climate change can be quite sobering and confronting, but I believe we are in a unique position to explore a range of adaptation measures to help sustain our trout fisheries for future generations. Trout fishing and the weather are intrinsically linked. Forecast blue skies raise hopes of spotting fish holding in the current or cruising a lake’s margin, not to mention a pleasant day with the sun on your back. Rain can literally put a dampener on the whole fishing experience. Solid rains at the right time are, however, vital to maintaining stream water levels, temperature and food for trout. The spring of 2016 was one of the wettest on record for south-east Australia. A wet catchment promoted riparian vegetation growth and was a boon for terrestrial insects. Floods washed extra organic material (leaves and sticks) into streams and flushed sediment downstream, promoting aquatic insects. These conditions raise the promise of a bumper trout season. I find, however, that my memories of the weather are often like my memories of fishing. 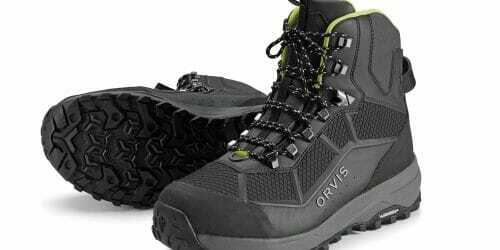 I’ve spent many a day wandering around the lakes of Tasmania’s Central Plateau, bracing myself against the relentless wind, rain and even snow. When the weather is like this and there is no sign of trout anywhere, spirits can get low. It doesn’t take much for fortunes to change. Maybe I spot a murmur or bow wave in a backwater, catch a glimpse of movement out of the corner of my eye. Maybe there is a break in the clouds and I spot a trout cruising, or maybe I get lucky with a speculative blind cast near an undercut bank. With a fish in hand, I quickly forget about the cold and declare my trip a resounding success. 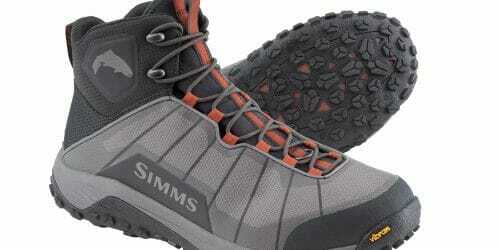 Similarly, it is easy to reflect on the here and now and think how wet conditions have been. To do so, however, is to ignore the hot and dry conditions of 2014–2015. For example, 2014 was the second warmest year on record for Victoria and rainfall was 17% below average. 2015 was the warmest year on record around the globe, Victorian rainfall was 23% below average and we sweltered through an extreme heatwave just before Christmas when it is usually much milder. These conditions spelt trouble for trout. 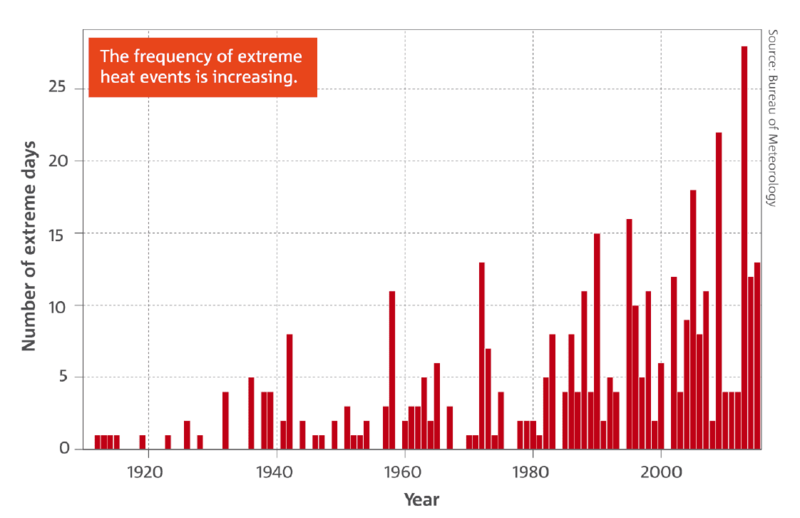 The Millennium Drought, that dreadfully dry period 1997–2009, is still fresh in many of our minds. This period of record low rainfall was a tough time for trout and trout-anglers alike as streams often shrank to a trickle. Further, the tinder dry Victorian bush was ablaze in major bushfires in 2003, 2006–07 and 2009. These fires not only resulted in large amounts of ash and silt being dumped into streams, choking all life, but also burnt valuable canopy cover that keeps water cool in the heat of summer. 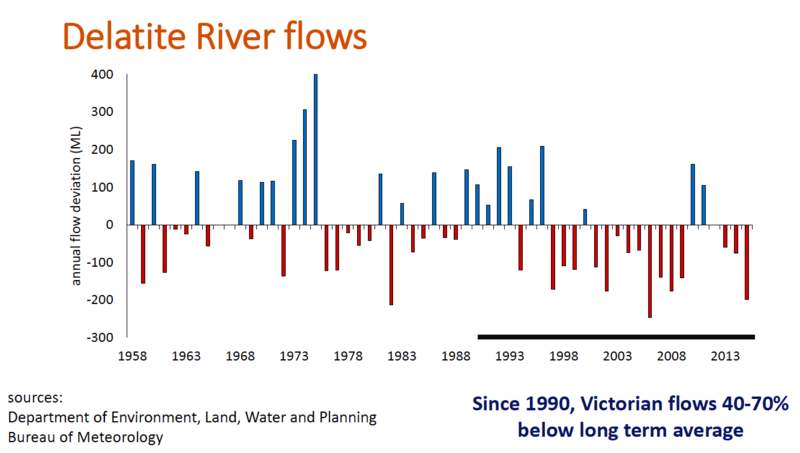 During this time, I led a statewide project investigating the response of Victoria’s freshwater fish to the unprecedented big dry. Startlingly, I found that trout abundance and the number of locations with trout actually present declined by about 20%. Trout did return after the drought breaking rains of 2010–2011, but the Millennium Drought experience provides a valuable glimpse into what we can expect under a warmer and drier future characterised by more frequent and intense bushfire, drought and flood. Indeed, modelling suggests that the distribution of Victorian brown trout could decline by as much as 35–50% by 2030 under some climate scenarios. Sometimes it is hard to see change coming, and often harder to understand what it means. Climate change is one of the biggest challenges faced by Australia’s trout, and we are collectively challenged to ensure something is done about it. It is important to remember that this is a global issue, with equal concern in world famous trout fisheries such as New Zealand and across North America. For example, the angler-led organisation Trout Unlimited actively undertakes research, public awareness and real on-ground activities to help conserve North America’s cold-water fisheries under a changing climate. 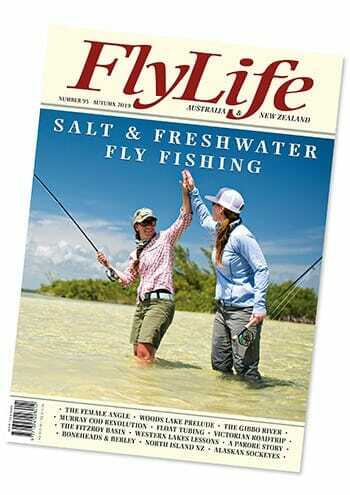 Here in Australia, we need to change how we view and manage trout fisheries. 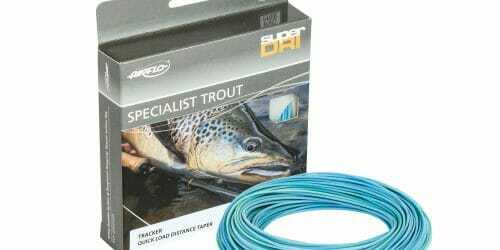 Luckily, we have a number of practical options available that may help protect trout populations in key rivers and streams. 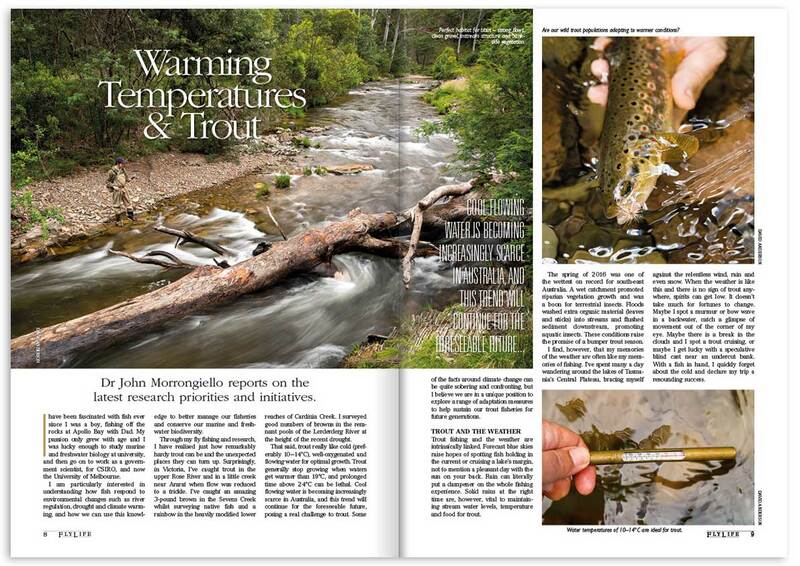 What can we do to counter warmer temperatures that impact on trout? One option that we are actively researching at the moment in conjunction with Fisheries Victoria and Goulburn Broken Catchment Management Authority is the targeted revegetation of trout streams to maximise stream shade. In some circumstances, shaded pools can be up to 10°C cooler than pools with no riparian vegetation. 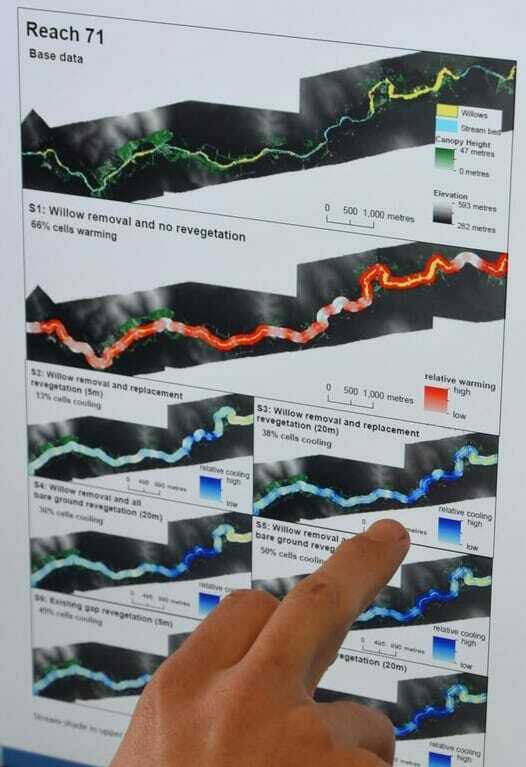 Our approach combines a complex solar radiation model with fine scale vegetation mapping (20 cm resolution) from LiDAR imagery across the upper Goulburn catchment. We can then estimate how much sunlight currently hits the water surface, and explore the benefits of trees along the stream channel. At the core of our work is the same logic you would use on your house to keep it cool: plant trees on northern and western banks to provide maximum shade from the hot summer sun and thus help keep streams cool. The challenge is how do you roll out this ‘logic’ across a complex landscape? It is important to remember that water temperature is not just determined by the nearest tree, but is also strongly influenced by what happens in the upstream catchment. All else being equal, trees upstream will have more of an effect on temperatures than trees downstream. This is where our models play a key role because they allow for the integration of local and upstream processes. The findings of our work will directly contribute to a recent Victorian Government initiative called the ‘Angler Riparian Partnerships Program’. We will help our catchment managers to prioritise where replanting should occur on our favourite trout streams to maximise the shading bang for buck. Riparian planting is not a short-term fix, but should have lasting benefit to our trout fisheries over the decades to come. Trout, like all fish, love good habitat. Snags, boulders and undercut banks all provide refuge from predators and a lie out of the current from which a trout can dart out and grab passing food, not to mention an ideal home for trout food. Unfortunately, key habitat has been lost in many of our trout streams due to a range of agricultural and forestry practices. Habitat restoration for fish is a major activity of our catchment and waterway managers. A recent review conducted by my research group found that returning snags to a river on average increases trout abundance by a massive 88%. Whilst restoring habitat does not directly deal with water temperature or river flow, it does play a vital role in maintaining fishery resilience. 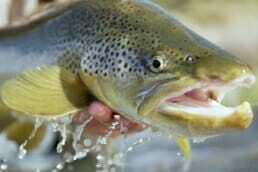 A trout is more likely to be able to cope with heatwaves and drought if it has a good place to live with lots of food. Trout have adapted to an environment here in Australia very different from where they came from in England 150 years ago. Could we harness any natural selection that has allowed this adaptation to ‘improve’ the chances of Australia’s trout persisting in a warmer future? It is possible that the hardy trout found in the Lerderderg, Rose or rivers further north have undergone genetic change to allow them to live in more stressful conditions. Adaptation in fishes can begin immediately if the selective force (here thermal stress) is strong enough. There has been ample opportunity over the last 150 years for this adaptation to occur. Intriguing research in both Europe and the USA indicates this does indeed happen in trout, with some populations showing clear adaptation to warm water. designed respirometry chambers. Metabolic rate, amongst other things, determines how efficiently trout convert food to body mass and behaviour, and is strongly influenced by temperature. We are soon to begin building on these early findings to determine whether some wild populations have indeed become adapted to warmer waters. More research is definitely needed, but maybe in the years to come we could be in a position to selectively breed trout from wild populations that are already ‘warm tolerant’ and selectively stock these into streams so that they could breed with the locals and make for a more resilient fishery. 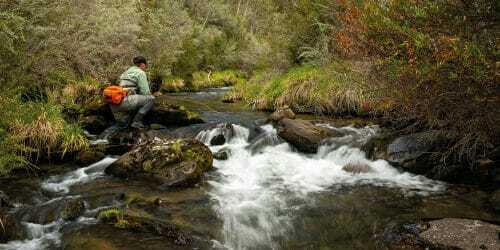 We as anglers also have a key role to play in managing our trout fisheries. It is us who catch the fish, and it is our behaviour that plays a vital role in determining whether a trout lives or dies post release. For example, minimising the time it takes from hook up to hook out, reduces the time a trout is stressed. Being conscious of keeping the fish in the water as much as possible is also important. Perhaps the most revolutionary idea stems from voluntary campaigns currently run in the USA. 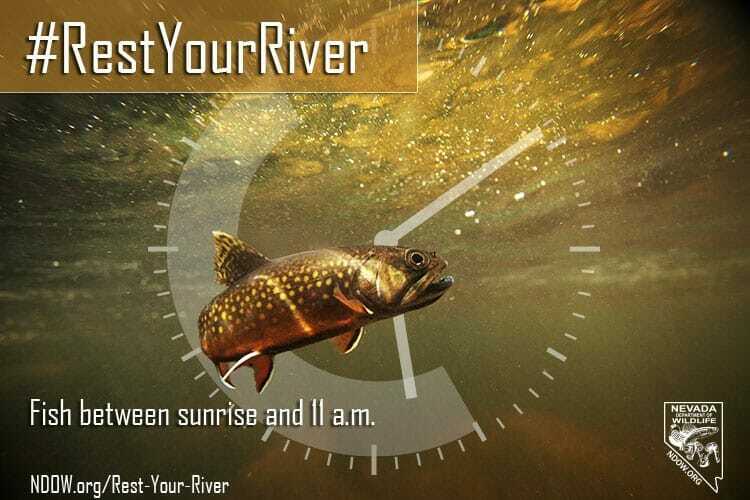 One, called ‘Rest your River’, encourages anglers to only fish between sunrise and 11 a.m. so that fish ‘can rest’ during the heat of the afternoon. This campaign is based on solid science indicating that the stress experienced by trout caught when the water is warm can be fatal. We make decisions about where and when we go fishing. No one wants an overly regulatory fishing experience, so the success of these initiatives hinges on their acceptance and promotion by us the anglers. We have a range of other options available including the identification and protection of key ‘cool water refuges’ in streams so trout can safely weather out tough drought years, an informed revision of fisheries regulation to ensure vulnerable trout populations are given a chance, maintaining our efforts to keep livestock out of streams, and managing dams to release cool water at critical times of the year. We’re living in a rapidly changing world. For many of us, trout fishing has been a mainstay in our lives — the cool push of the water against our legs and watching a dry drift down a run in the afternoon light must surely be among life’s pleasures. However, just as the world around us is changing, we too need to change our expectations of fisheries and adapt our behaviours and management to ensure they remain viable. With some careful consideration, pragmatism and action now, we can continue to enjoy our unique trout fisheries for many years to come. J. Stein. 2011. Using species distribution models to infer potential climate change-induced range shifts of freshwater fish in south-eastern Australia. Marine and Freshwater Research 62:1043-1061.